The southwest Chicago suburb of Joliet will soon be home to a new justice center. 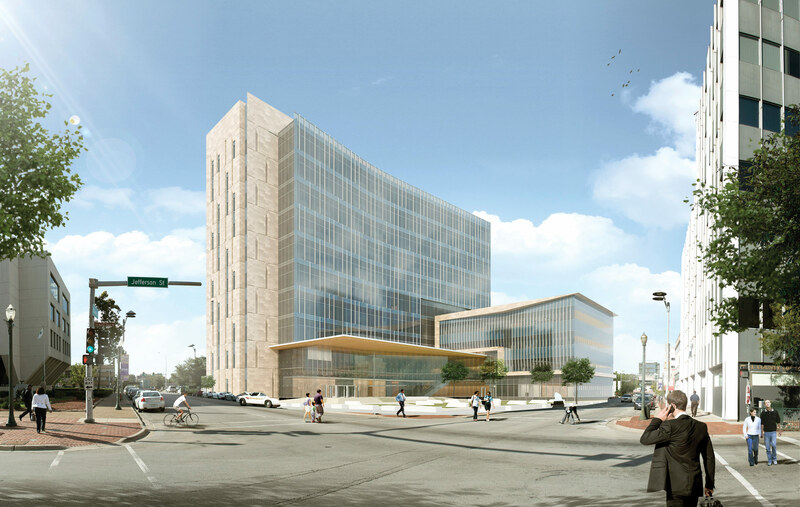 Chicago-based Wight & Company has released the first rendering of the future Will County Justice Center, which will serve one of Illinois’s most populous counties and replaces an outdated 1960s structure on an adjacent site. Wight worked with Lohan Anderson principal Dirk Lohan on the early development of the project as part of a new relationship between the offices. The design for the new center is meant to transform public perception of the justice system, with an emphasis on openness, transparency, and accessibility. The project features green roofs and a landscaped public plaza. Extensive high-efficiency glass brings sunlight into the project while maintaining sustainable goals. The justice center will initially house 28 state-of-the-art courtrooms with the ability to expand to 38 as the needs of the county change. Criminal, civil, and family law cases will be heard at the new facility, which will also have a law library and self-help legal center. Completion date is 2017.